When you think of impossible buildings, mazes without finish, and mind-bending architecture, one name comes to mind: Escher! 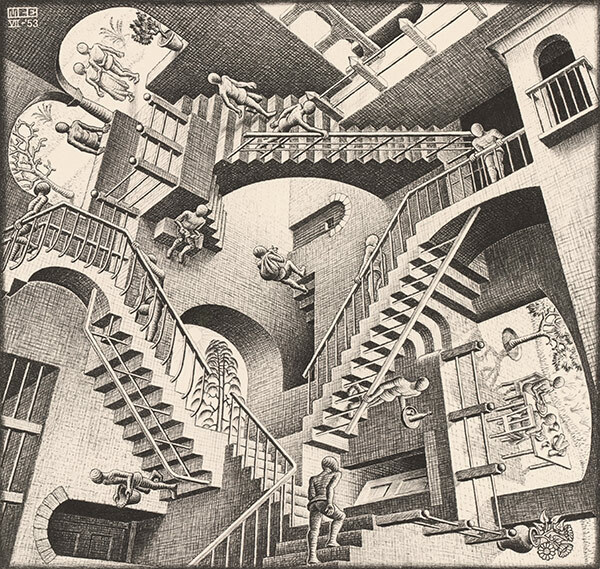 Maurits Cornelis Escher, famously known as MC Escher, was born in Leeuwarden, Netherlands on June 17, 1898. MC struggled in most subjects in school during childhood, but always did exceptionally well in drawing. After college in 1922 he traveled extensively throughout Italy where he met and married his wife Jetta Umiker. The couple traveled throughout Italy for over a decade, creating his masterpieces he would take back to Rome to print. Upon their return, the couple was met with political unrest in 1935 under Mussolini and they relocated to Brussels, Germany for the next 6 years. In 1941 as German troops occupied Brussels the couple moved to the Netherlands where they stayed until 1970. Throughout Escher’s lifetime, he created 448 lithographs, woodcuts, and wood engravings and well over 2000 sketches and drawings. He is best known for his exceptional use of mathematics and relationships with shapes, figures and space illustrated in many of his drawings. His use of these shapes interlocking and often composed with impossible objects, have his fans and the art community amazed at his creativity decades later. He is famously known for his piece Relativity, and his use of space, perception and shapes in the various elements of the print. His use of black and white to enhance the dimensions is masterfully displayed in famous work. Come join in on the fun in Redwood City next month for PAL’s 12th annual festival. This family friendly event offers great music, local art, BBQ, kids zone and more, to have a great day in the South Bay. This year is a special rendition of the festival, highlighting Women in the Blues, with famous women musicians being honored including Lady Bianca, Pamela Rose, Sugar Pie DeSanto, and many more. There will be local art featured in booths throughout the festival, and some of the best BBQ in CA will be available to chow down and feast on. It truly is a great way to spend a beautiful summer day in Redwood City, and enjoy this wonderful celebration. For more information visit their website here. Week 4 – Hike through Castle Rock and let your imagination run wild! Summer camp week 4 theme is Mythical Creatures and what better place to let your artistic creativity flow, than a hike through Castle Rock and having fun drawing the creatures that your mind imagines once walked this mythical forest of beauty. Giant trees, amazing rock formations, and caves, we will spend the week learning about the mythical creatures of the world and enjoying creating art from your imagination. We hope to see you soon! Week 5 – Do you love fashion, and keeping up with the ever changing trends of the Bay Area and beyond? Week 5 is called Passion for Fashion, and that’s exactly what we do. We will study the world of fashion and imagine the fashion of the future, and as we wander the halls of the “Degas, Impressionism, and the Paris Millinery Trade” in Legion of Honor in San Francisco with our sketchbooks, we will take notes to bring back to the studio to put to canvas. If you have love for fashion, and want to put your passion and love to canvas, this is the perfect summer camp for you! We hope to see you soon. Art Attack is a fun and interactive art studio in the San Francisco South Bay Area that provides instruction in the fine arts to children, teens and adults. Art Attack offers affordable painting classes year round to the residents of the San Francisco Bay Area and Burlingame. We have art classes for kids ages 5 and up with after school and weekend classes, as well as teen and adult art classes Monday through Saturday. Looking for a place to have a fun and unique party? Art Attack Burlingame also has Arty Parties which are perfect for any occasion: birthdays, showers, girl’s night out and even office team building!